It might surprise you to learn that when I tell people I published a business book, the first question I'm most frequently asked is not "What is the book about?" or "Why did you write it?" Instead, it's "Did you self-publish?" When I tell them that my book was published by a traditional publisher that paid me to write it, I generally get an "Oh, really?" with an eyebrow raise--and then we almost immediately jump to a "How did you do that?" conversation. It's interesting to me that the assumption is that I self-published, and I think this has as much to do with an overriding belief that self-publishing is the path of least resistance and also that securing a publishing contract is impossible. I'm here to tell you that getting a traditional publishing deal to write a business book is absolutely possible, and I'm not diminishing self-publishing in the least. About 18 months ago, I began a fascinating journey, which has since led to the publication of my first book How to Protect (Or Destroy) Your Reputation Online. Last year, I blogged about how I got my book deal, so I'm not going to go through all the precise details again, but I will say that if you want to write a business book and have it published by a traditional publisher, it's well within the realm of reason. And I'm happy to help you. If you have resolved or dreamed of writing a book, then we should definitely talk. If you feel confident about these questions, then you are a good candidate to write a business book. Do you have a meaningful idea or story to tell? Do you have a different take on a traditional topic? Have you undergone an interesting journey for which you believe the lessons learned would be of interest to others in business? Do you have a process for building businesses, marketing businesses, motivating employees, increasing sales or creating new leaders? If there's a problem in the marketplace that you can help solve or if you can shine light on a topic that others don't yet understand, then you are likely a candidate for a business book. One thing to remember is that everyone is interesting in their own way. While each entrepreneurial journey is inspiring on some level, just being successful is not enough. You must be ready to educate and entertain. Writing a book is a labor of love that can be very good for business, but you must want to do it. While you need not be the greatest writer in the world (that's why we have ghost writers and editors), you do have to want to embark on this type of project because it takes time, work and effort on part of the would-be author. Most executives can't afford to commission a book, so you must want to do it. And wanting to write it to improve your business is an excellent reason. While being known as a published author is a great ego boost, it can be a secondary point to wanting to distinguish your business, position yourself as an expert and to make money. Do you have a "platform" and if not, are you willing to build one? The cold reality of book publishing is that much of the marketing responsibility falls to the author, and the publishing companies want authors who will help them sell the book. Potential authors need to be able to reach their audience through marketing, social media and other sales efforts. In the publishing world, this is called your platform. Do you have a substantial number of subscribers to your blog? Do you have thousands of followers on social media? Do you give speeches or presentations which would be good venues to sell your book? Are you quoted in the media, giving you chances to plug a book? Publishers will evaluate your platform with the same scrutiny as your book idea. All is not lost though. If you are willing to build your platform, then you can also succeed. If you answered yes to these questions, then a business book can be in your future. The next step is to tackle it like you would any other business problem, with research and solid thinking. Develop your main idea, research the market to determine it is new and hopefully unique, start drafting a book proposal and then refine these elements until you are comfortable pitching a literary agent. 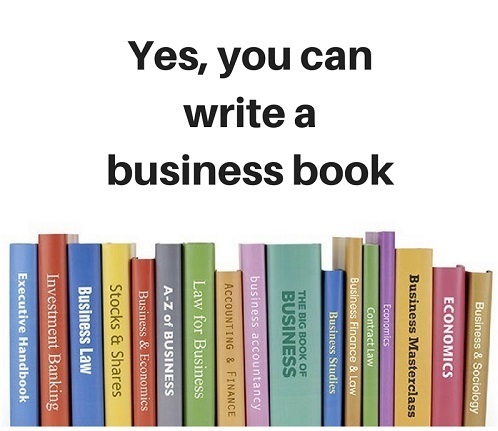 I wrote more about the specifics in this post last year, and I truly believe that any business executive can write a book proposal. Determine if you have the right idea, decide that you truly want to embark on the journey, assess your platform and then get to it. And call me if you want help.